You don’t need us to tell you that the city and county are in the midst of a homelessness crisis—the worst in the region’s history and the worst in the nation. Just look out the window on your daily commute. While a host of recent funding measures have helped to decrease L.A. County’s total homeless population by 3 percent since 2017, the number of people experiencing homelessness for the first time is still on the rise, and L.A. has a lot more to do to address the issue’s root causes. The info that follows can’t possibly tackle the entirety of a topic as complex and fraught as this—you’d need a textbook for that—but it does offer clarity about where your money is going, what steps are being taken, and what other efforts we can expect in the coming months. Nonprofit organizations have long played a central role in helping the region’s homeless. The Home for Good funding collaborative alone has raised almost $40 million since 2012. “It’s nonprofits that are trying to fund the housing, negotiating with the landlord, and staying with the individuals to provide them the services they need,” says Ruth Schwartz of the Shelter Partnership. But the crisis has far exceeded the limits of what nonprofits can achieve. So the city and county have finally kicked in with three funding measures. Given their overlap, it’s worth stepping back for a refresher on which does what. What it is: A $1.2 billion city bond measure passed in 2016. What it’s funding: The construction of between 8,000 and 10,000 housing units over the next decade. Most projects will include access to supportive services like clinics, counseling, drug and alcohol treatment, and job training. Who’s paying for it: City residents are taxed $9.64 annually for each $100,000 of the assessed value of the property they own. For the median home value, that’s about $33 per year. Progress report: It started slowly, but a Supportive Housing Ordinance passed in April cut down on red tape. “It’s going to make projects go through the permitting process quicker and be less costly to develop,” says Schwartz. So far, there are 26 housing projects in predevelopment and three under construction, totaling 1,965 units. Council members have also pledged to approve building 222 supportive units in each of the 15 districts by July 1, 2020. What it is: A fee for most new construction in the city. Approved in 2017 by the city council, the ordinance is being phased in over the next year. What it’s funding: The revenue is being funneled into the city’s Affordable Housing Trust Fund and could help build or maintain up to 1,767 affordable housing units per year, depending on how officials decide to spend it. A plan should be approved this year. Who’s paying for it: Developers pay up to $15 per square foot of construction, based on the nature of the project and where it’s located (developments that include affordable units are exempt). Officials estimate this will create a revenue stream of about $100 million per year. Progress report: The ordinance will be fully implemented by 2019. While the plan’s opponents worry that it will discourage construction, affordable housing proponents say it’s been a long time coming: Garcetti first proposed the fee in 2015. What it is: A ten-year, quarter-cent sales tax increase approved by county voters last year that’s expected to raise $355 million annually. 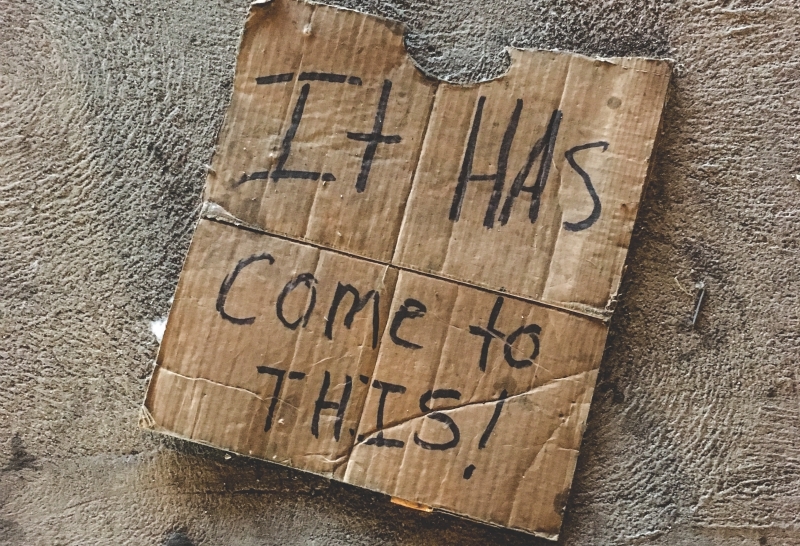 What it’s funding: In large part, stopgap measures like temporary and crisis housing, rental subsidies for people on the brink of homelessness, and supportive services like health care, job training, and outreach teams. Who’s paying for it: Anyone who pays sales tax in the county. Progress report: Since July 2017 Measure H revenue has, according to the county, helped more than 10,000 people find temporary or permanent housing and funded more than 1,000 new jobs in the homeless-services sector. It has also helped launch programs to aid families cover rent, utilities, and other expenses. And it’s been used to improve coordination among departments. “Things are much more streamlined today,” says Schwartz. There’s slightly more than one shelter bed for every three homeless people in the L.A. area. Not all beds are available year-round either, and many people would rather avoid shelters, which can be crowded, dangerous, and restrictive: They don’t accommodate pets or partners and severely limit possessions. As the city chips away at its plan to build at least 10,000 affordable housing units by 2021, it’s looking for ways to shelter people in the meantime. These are four alternatives that could be part of the solution. L.A.had more than 380 motels, with a combined 10,259 rooms, and an ordinance passed in April aims to use some of them for homeless tenants. Participating motel owners must agree to work with agencies to provide supportive services. In return? They’ll be exempt from certain zoning laws that might otherwise require costly upgrades for compliance, and they’ll be allowed to equip guest rooms with full-size refrigerators and some cooking equipment. The property owners are also able to work with nonprofits in order to tap into county rent subsidy funds. More than 100 public parking lots across the city have been flagged as potential sites for permanent housing. But in the near term, City Councilman Jose Huizar plans to install five trailers near Olvera Street this summer as a temporary solution. At a cost of $2 million for the first year and $1.3 million to run annually thereafter, they’ll provide beds, showers, laundry facilities, and supportive services for 60 to 70 people, with new tenants coming in every six months. It’s a start. “We’re hoping to find other publicly owned properties that we could convert into immediate shelter,” says Huizar. Otherwise known as granny flats, accessory dwelling units—the wee homes that share lots with single-family houses—are being embraced by the state as a way to increase afffordable housing and decrease homelessness. California has eased its building and zoning restrictions, and last year Los Angeles County launched a pilot program that gave a handful of qualifying homeowners up to $75,000 to build an ADU in their yard or $50,000 to revamp an existing structure. In return, they must agree to rent to previously homeless tenants for at least ten years. The city’s Innovation Team is also experimenting with funding models to help homeowners build more ADUs, which could at least help increase the supply of affordable housing. Designed by USC architecture students and the Martin Architecture and Design Workshop in 2016, Homes for Hope’s modish, 6½-by-11-foot pods are intended to be stackable, easily reconfigured, and code compliant. The cost? Around $25,000 each, though that could go down with mass production. The inspiration came from makeshift shelters seen on the streets. “These communities are master builders. They’re super inventive and experimental, and use what they have,” says Sofia Borges, who co-taught the course. A fund-raising effort for a pilot project in Sylmar with Hope of the Valley Rescue Mission is under way. While encampments have sprung up all over the county since the Great Recession, skid row has always been L.A.’s epicenter of homelessness. Stretching for roughly 50 blocks, the tent-and-tarp-filled area is the largest of its kind in the nation, with 2,000 or so people sleeping in its streets each night. That it’s endured despite development pushing in on its borders in recent years is no accident. In 1972 a “Silver Book” plan drafted by downtown business interests sought to relocate skid row’s residents so the land could be redeveloped. But what prevailed was the “Blue Book” alternative, aka the “Containment Plan.” It drew boundaries around the neighborhood to preserve what cheap housing remained and to locate homeless services there. “People interested in saving low-income housing were in favor, as were people who didn’t want any of those people in their neighborhood,” says John Malpede, founder of the Skid Row History Museum & Archive. While some say the containment plan created a dumping ground for vulnerable residents, Malpede notes, “It’s become a neighborhood. It has a lot of self-awareness and has been able to advocate for its preservation.” Here are a few lesser-known facets of skid row history. Originally an agricultural area, skid row industrialized with the arrival of the trains in the 1870s. Bars, brothels, and hotels sprang up to cater to rail-riding transients and part-time workers. It became a hub for migrants from the South and Midwest during the Depression. Alcoholism was rampant. In the 1950s the city cut the supply of cheap housing in half when it demolished many of the area’s by-then-battered hotels, driving their occupants onto the streets. 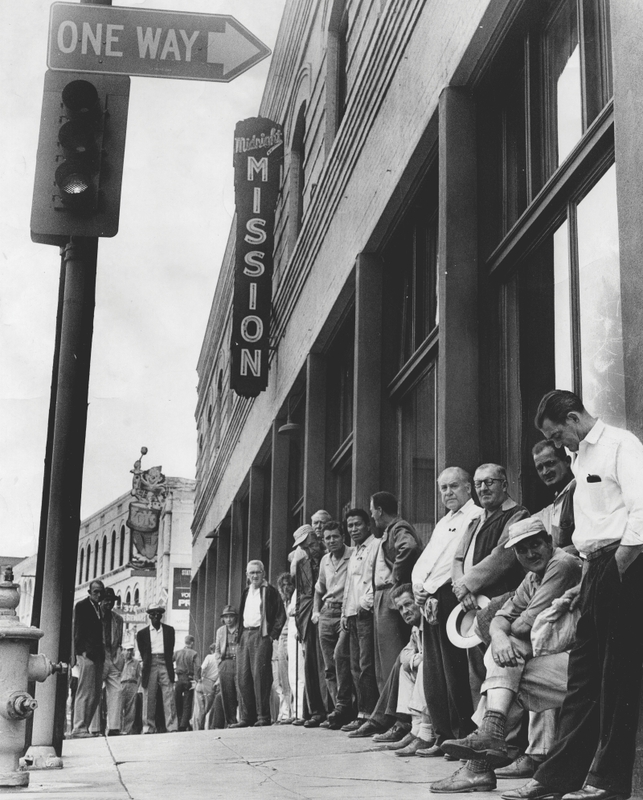 The demographic makeup of skid row—mostly white, male, and elderly—shifted as Native Americans poured into L.A. following 1956’s Indian Relocation Act. Nicknamed “Indian Alley,” skid row’s Winston Street became the site of the United American Indian Involvement center in 1974. The area’s black population grew when Vietnam veterans returned in the 1960s and ’70s, and surged again during the ’80s crack epidemic and war on drugs. Today skid row is mostly black. Skid row has official boundaries: 3rd, 7th, Alameda, and Main streets. And residents want it to have an official neighborhood council as well in order to enable them to advise city officials about land-use issues amid DTLA’s development boom. A recent effort ended in a controversial election and lost by 60 votes. Activists blame a last-minute decision to allow online voting, which is typically banned for neighborhood elections, that effectively excluded many skid row denizens. The encampments you see lining sidewalks on 8th Street are permitted by the LAPD because of a legal battle that sprang from skid row. The 2006 decision in Jones v. City of Los Angeles overturned a “quality of life” ordinance that banned people from sleeping, lying, or sitting on city sidewalks at any time. Filed on behalf of six homeless people, it determined that arresting violators when they had nowhere else to go amounted to “cruel and unusual punishment.” Since then, people have been allowed to stay put between 9 p.m. and 6 a.m.
Born on skid row, activist Steve Richardson, aka General Dogon, has been pressing for change in the area. “My parents met on skid row in the ’50s. I grew up there in the ’70s, and in the early ’80s I got addicted to crack cocaine. I ended up in state prison, where I read a lot of black history books and got involved with political activism. After 11 years I came back to skid row, and downtown was in the midst of being gentrified. They had these ‘business improvement’ security guards who’d harass people. In 2006 L.A. launched the Safer Cities Initiative, which brought 50 extra police to skid row. They’d pull up on homeless people, claiming they were loitering. ‘Loitering’ is hanging out with a criminal intent. Just because you’re on a public sidewalk and black doesn’t mean you’re loitering. I got involved with L.A. Community Action Network, and we created a watch team. We’d document interactions with security guards and the LAPD and teach people their rights. We created a community report card called The Dirty Divide to document public health-and-safety infrastructure, like trash cans and bathrooms. Hey I participated in LA’s annual count of people experiencing homelessness. Relevant to my interests in civics and vest fashions. More than 500 city and county employees fan out in teams to help the homeless get food, health care, clothing, and the like. Funding from Measure H will only grow that number. 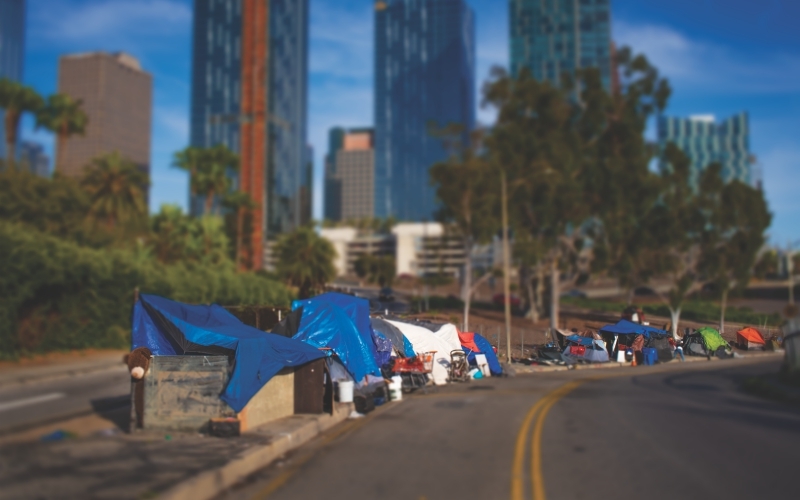 “We are going into riverbeds, encampments, and under bridges,” says Colleen Murphy, outreach coordinator for the Los Angeles Homeless Services Authority. Metro even has its own outreach program on the Red Line, which has become a de facto shelter. Here’s how they work. A fresh set of clothes can be a big help when you’re trying to get a job or secure housing. Vouchers for thrift stores and free clothing closets are two of the most common ways that outreach teams help people get garb, says Murphy. To keep those clothes clean, a handful of nonprofits, such as LAMP and the Downtown Women’s Center, offer laundry facilities. Toilets and showers for the homeless are scarce, and existing ones have been closed down repeatedly, owing to concerns about drug use and prostitution. So people use the sidewalks as toilets. Following last year’s hepatitis A outbreak, L.A. opened a small skid row facility with toilets, showers, and attendants, but more are needed. The nonprofits Lava Mae and the Shower of Hope are working with the county to develop a mobile shower program. LAHSA estimates that 33 percent of homeless people in the city are mentally ill. Teams with mental health professionals give field assessments. Some clients get “light therapy,” says Murphy; others might be directed to county psychiatric facilities. But space is finite, and because of strict limitations on treating people against their will, even patients who are a danger to themselves can refuse. Unlocking benefits like Social Security disability income and housing requires birth certificates, ID cards, et cetera. So outreach teams prioritize helping clients obtain copies. “We have vouchers so the ID is either free or at a discounted cost,” says Murphy. “If getting to the DMV is challenging, we can transport the client, go with them, and help.” Covering the cost of public transportation is also an option. Buying food to supplement the hot-meal programs run by churches, shelters, and homeless organizations costs money. Another early step outreach teams take is to help clients sign up to receive financial aid, whether from Social Security, disability income, or the county-funded General Relief program, which can provide up to $221 a month. Street teams help people enroll in health coverage or connect them with physicians; some even include a nurse who can conduct exams. “Having nurses on the ground and being able to assess if that’s a serious wound or some other issue is huge,” says Murphy. But there’s a long way to go: Of the 831 homeless deaths in Los Angeles County last year, a significant number were linked to preventable health problems. It’s a vicious circle: The rules and laws that essentially aim to curb homelessness often just complicate maters. Limits on what people can bring to homeless shelters can dissuade them from sleeping there. Fines doled out to people who can’t pay them lead to arrests and criminal records, which makes finding a job more difficult. Encampments are rousted, spurring the people in them to move somewhere else. A quick tour of some modest remedies. $87 million is spent by the city on homeless arrests, skid row patrols, and mental health interventions each year. 19 percent of people arrested by the LAPD in 2017 were homeless. 14,506 of those arrests were made for misdemeanors, many involving citations for storing property or sleeping on the sidewalk. In a courtyard at downtown’s Central Library, the Homeless Court ticket clinic is in session. Catherine Clay stands twiglegged in heavy boots, reading numbers of a clipboard to a patient crowd. “One twenty-six! One twenty seven!” cries the tiny 43-year-old. Clutching papers, the chosen few head to the canopied rows of city attorneys to get their citations cleared, much like Clay did five years ago. “Now I’m here as a giveback because I’m grateful it worked for me,” she says. Homeless off and on for 15 years before being placed in affordable housing, she’d accumulated around $15,000 in fines for driving violations and other small offenses. Tickets come with the territory when you’re living on the streets of L.A., where just lying on the sidewalk can result in a $35 “quality of life” citation; left unpaid, it can snowball into hundreds of dollars or a bench warrant. Held every couple of months, the clinics don’t tackle the debates raging around the ethics of such enforcement, but the program does enable people to work of those fees with community service and counseling. “I was just extremely happy I didn’t have to decide between paying these tickets and moving into my apartment,” says Clay. For the 25 percent of homeless Angelenos who live in their vehicles, trying to find a safe, legal place to park at night can be frustrating. While camping on the sidewalk is permitted between 9 p.m. to 6 a.m. in L.A., sleeping in your car at night can lead to costly fines in most areas. “If you live in your vehicle, your vehicle is vulnerable all the time. It’s really hard to stay citation-free,” says Emily Uyeda Kantrim, who runs Safe Parking L.A. 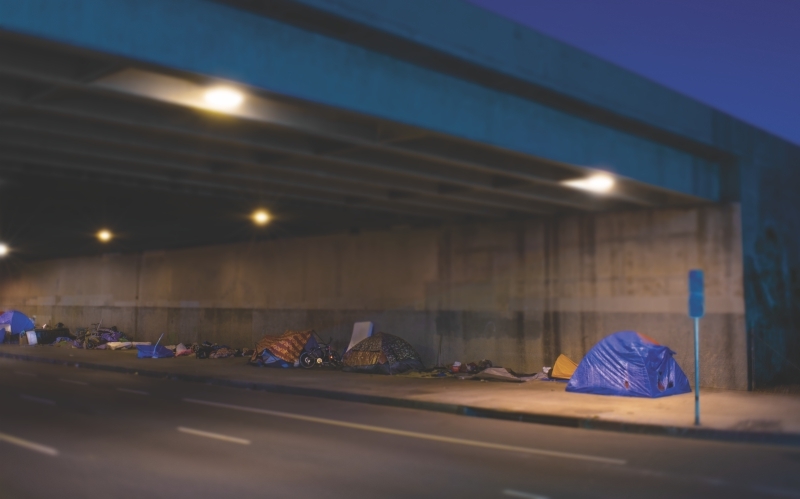 Founded in 2016, the nonprofit assists churches and businesses in hosting the vehicular homeless in their parking lots at night while providing portable bathrooms and security and helping connect people with other supportive services. The catch, once again, is neighborhood opposition. Only four of these lots have been established so far: three by Safe Parking L.A. and another by the city, which plans to launch a safe parking program of its own this summer. Each morning, homeless people flock to the Bin, a free skid row storage facility run by the nonprofit Chrysalis. Sorting through the 60-gallon city-donated trash bins where they keep their items, visitors grab clothes, take medicine, and tuck away tents. Safely stowing their stuff gives folks a sense of dignity, says Chrysalis vice president Trevor Kale: “You can go and make your appointments without carrying a humongous bag. It’s freedom.” It also ensures their belongings won’t get them in trouble with police, since anyone who stores too much in a public area can be cited, arrested, or have their possessions confiscated. How much is too much? Under a city ordinance, everything must fit in a 60-gallon container. The challenge is how to replicate the Bin’s success: The facility is one of only three in L.A., because efforts to open new locations have faced stiff neighborhood resistance.